Quail Creek is located just minutes from St. George, Utah in Washington County. It has a healthy population of Largemouth Bass as well as abundant bluegill. Black Crappie are a little harder to find but grow to a large size and are fun to catch. In the cooler months, you can find some good Rainbow Trout fishing here as well. Launch Ramp: Conditions at main ramp are decent. The water level has dropped a lot but there is still a launch ramp. Boat ramp is closed during certain hours of the day; see boat ramp hours for more information. South launch ramp is closed due to low water. Fishing pier is now closed with lower water levels. Be careful within 150 feet of shore line for submerged trees around reservoir as the water levels have dropped. Campground: Reservations are always recommended. No more than two vehicles per site no exceptions. The campground can not accommodate multiple camping units per site. Potable water is provided in different areas within the campground. Fires: Fires are allowed. Wood, charcoal, and propane/gas flame are allowed. NO FIREWORKS allowed in state parks. Water Level: Water level is very low. Be careful within 150 feet of shore. Main boat ramp is open. South ramp is closed. Fishing Conditions: utahfishinginfo.com/dwr/fishingreports.php Conditions are great for Trout and tough for Bass. Trout have been very active due to the recent drop in temperature. Bass are sitting in deep water and not as active. Quagga: All out of state boats will be inspected before launching. Boats requiring decontamination must go to Sand Hollow State Park. Fishing has been good in the evenings. All ski/wake boats must have drained and dry tanks/bags. 30 day dry time or decontamination wash for ALL ski/wake boats with ballasts tanks/bags. When traveling from one lake to another, please be sure to pull your drain plug. Boats: Remember to check your boat registration and bow numbers before bringing your boat out. Be sure to have all the necessary safety equipment to avoid a citation. On-Site Concessionaire: Check out paddle boarding at Quail Creek. http://digpaddlesports.com/ Rent paddle boards at the park and get everything you need on site. Fires are allowed in designated fire rings only. Fees were increased in April 2018. Pay by envelope at iron-ranger when gate is unattended during winter hours. Ice is Never 100% Safe! — Do not judge ice safety on thickness alone. Ice does not form or maintain a uniform thickness. Snow, wind, slush, temperature, and other factors can cause ice thickness and strength to vary greatly, even within inches. Recreate on ice at your own risk and verify ice thickness as you head out. Click here to learn more ice safety tips. 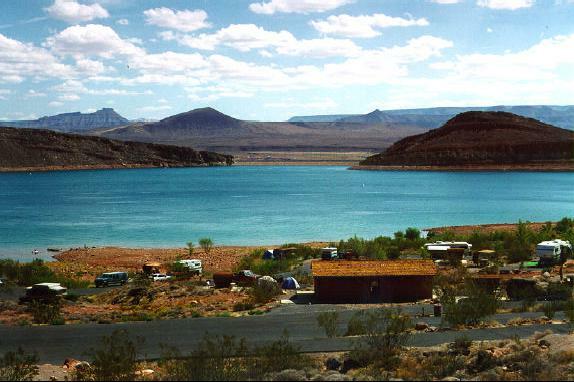 Don"t forget to visit nearby Sand Hollow Reservoir as well for more excellent bass and bluegill fishing.